The Vanuatu Qualifications Authority is the institution whose task it is to grow and safeguard the quality of Post School Education and Training (PSET) in Vanuatu. 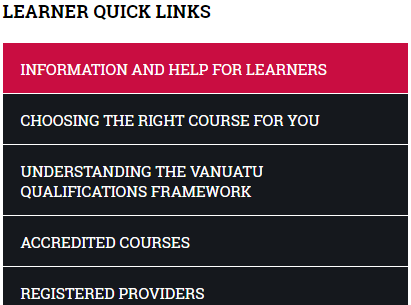 If you are looking to study a PSET course in Vanuatu and you would like to receive quality education, then this website has very important information for you. With this website we want to give learners a large amount of important information for when they are planning to undertake study in a PSET course. We explain on this website why it is very important for your future to select an Accredited Course from a Registered Provider and how you can do this. A lot of the information you can find in the "For Learners" main menu item. But you can also find information under News & Publications and About Us that you may find interesting. And for when you have already completed you study, how to get a printed document as evidence of your results. Just move your mouse over the "For Learners" menu text, and the menu will drop down. Click on any of the items and you will be taken to that page. When you are on one of these pages, most of the time we will show you a menu on the side as well, with "Quick Links". You can use these to quickly jump to other information you are looking for. If the item has a litte "+" behind it, there are more links hidden underneath. Click the menu item to reveal them. If you are looking for some information and have a hard time finding it (which we hope we have been able to avoid, but just in case), please use the "Search" button at the top right of the page. This will search through all the articles that are on the website. Unfortunately we cannot search inside uploaded documents.